A painting which combines technical skill with a naïve vision, this intriguing still life has an affinity to works by William Merritt Chase (American, 1849-1916): for example, An English cod, 1904, Corcoran Gallery; Still life, fish, 1912, Brooklyn Gallery; Still life with fish, Vanderbilt Fine Arts Gallery, Fish still life, 1908, Art Students League of New York, etc. At first glance a work with ties to the Spanish still life school, this may in fact be by a pupil or follower of Chase, one of the most important American teachers of his period. Some passages of paint – for instance, in the large red fish in the centre, the crab and the knife – are very accomplished, and the more naïve elements (such as the handling of the salt cellar, and a tendency for some objects to float free of the table top) may indicate that it is indeed the work of a student. The colours, viewpoint and combination of objects are all extremely close to those in Chase’s paintings, and demonstrate his skill as a teacher; but this is also a striking and decorative work in its own right. For further reading on this topic, please click here. Student or follower of William Merritt Chase (1849-1916). Chase moved to New York in 1869, and studied at the National Academy of Design under a pupil of Gérôme; he later attended the Academy of Fine Arts, Munich. When he returned to the US he taught (between 1891 and 1911) at the Shinnecock Hills Summer School, Long Island; the Chase School of Art (later the New York School of Art); the Pennsylvania Academy of the Fine Arts; the Art Students League of New York; and the Brooklyn Art Association. 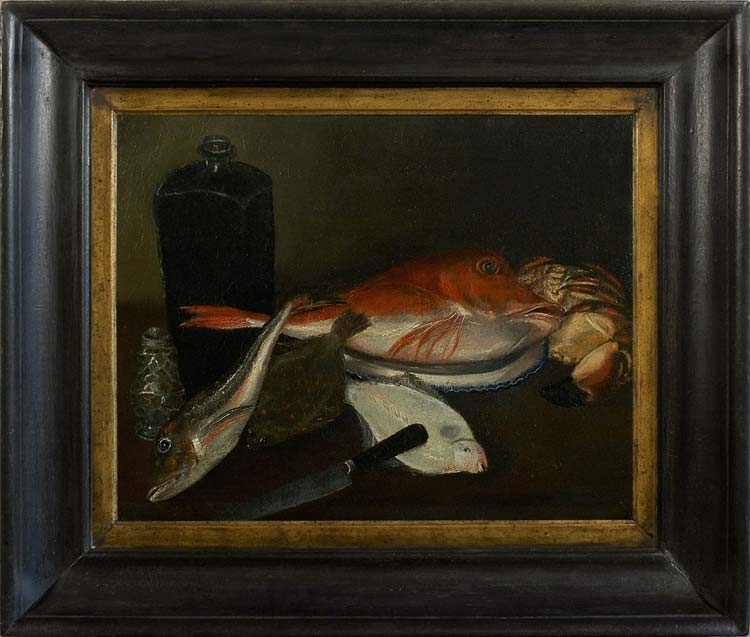 Chase painted still life arrangements from his student days onwards, and is most noted for his compositions with dead fish, often arranged on a plate and against a dark ground.